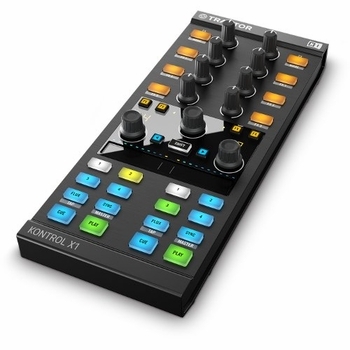 Native Instruments Traktor Kontrol X1 MkII DJ Controller DJParts - All Variety of Parts that DJ Needs. Boasting reactive performance behaviors, Traktor Kontrol X1 MKII takes care of the details behind the scenes. The advanced Browse and Loop encoders respond to touch and command Traktor to access different views or functions – just touch the Browse encoder to see the full-sized Browser list. Touching the Loop encoder while holding SHIFT+PLAY lets you see the key of your track. Touching the Loop encoder while holding SYNC lets you see the tempo. The touch strip also interprets functions based on deck status – when stopped, it’s assigned to track seeking or needle dropping. When playing, pitchbend is activated. For your own trademark sound, assign the touch strip to control any effect parameter in seconds.